Here is the weekly review of the top performing Rams alumni, who are currently playing in pro basketball. #1. Experienced Christian Burns (6'8''-F/C-85, graduated '07, plays pro in Italy) managed to help AX Armani Exchange Milano to win against the eighth-ranked Virtus Bologna (9-8) 94-75 in the Italian Serie A on Sunday night. He scored only 3 points and grabbed 4 rebounds in 20 minutes. AX Armani Exchange Milano (15-2) is placed first in the Serie A. It's Burns' first season with the team. This year Burns averages 6.0ppg, 4.5rpg and 1.2spg. He is a naturalized Italian. #2. Peter Alexis (7'0''-F/C-92, graduated '16, plays in Poland) could not help Miasto Szkla Krosno (4-13) in their last game. Despite his good performance Miasto Szkla Krosno lost 75-83 on the road to the higher-ranked (#9) Start. Alexis was the second best scorer with 14 points. He also added 8 rebounds; quite an impressive performance considering it's only Alexis' third season in pro basketball. Alexis has relatively good stats this year 11.0ppg, 9.0rpg and 1.7bpg in three games he played so far. #3. 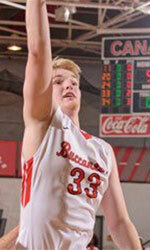 Nick Schlitzer (6'6''-G-92, graduated '15, currently in Iceland) contributed to Valur's victory against the seventh-ranked Grindavik (7-9) 100-96 in the Icelandic Dominos League last Thursday. Schlitzer recorded 6 points and grabbed 5 rebounds in 22 minutes. Valur Reykjavik (12-6) is placed third in the Dominos League. It was his team's eighth consecutive victory in a row. 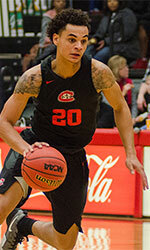 This season Schlitzer averages 6.0ppg and 5.0rpg. He is a naturalized Italian. #4. Kaison Randolph (6'3''-G-95, graduated '18, plays pro in Spain) was not able to help Cordobasket in their game against Utrera (9-6) in the Spanish EBA (fourth division), despite his very good performance last Saturday. He had a double-double by scoring 31 points and getting 11 rebounds. Randolph also added 2 blocks; not bad, considering it's only his first season in pro basketball. But the seventh-placed Cordobasket (8-7) lost 70-79 at home to the higher-ranked (#3) Utrera in the Group D-B. There are only three games left until the end of the Regular Season. So now every game will be critical. Randolph has individually a very good year with high stats. He averages 24.6ppg, 4.9rpg, 1.6apg and 1.6spg in 15 games.